Jennifer Foos is a full time realtor and has 8 years of experience. 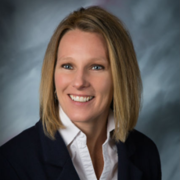 She is a member of the Heartland Board of Realtors, on which she has sat on the Board of Directors, as well as the Firelands Board of Realtors. Jennifer also belongs to Ohio and National Association of Realtors and has earned OAR Presidents Sales Club Award of Achievement for the past 5 years. She resides in Findlay with her two very active daughters Morgan and Molly. Serving on the social committee for Findlay Soccer Club and the Constitution and Bylaws committee for Heartland Board of Realtors are just a few of the organizations she donates her time to. Jennifer invites past, present and future clients to swing by her office and visit "The Next Jen-eration in Real Estate". Call text or email her 418.889.8516 or jfoos002@woh.rr.com.